Striking contemporary South Australian art has been integrated into the design of the new Royal Adelaide Hospital – here’s our exclusive first look at the works. This art tour came with unusual requisites – including donning a hard hat, steel-cap boots, high-vis vest and safety glasses. Long trousers and a long-sleeve shirt were also compulsory. On a sticky 35-degree day, it seemed a big ask. But the art was at the new Royal Adelaide Hospital ­- which is still an active building site. Around 26 South Australian artists have been involved in creating works to be integrated into the RAH design, and although the hospital isn’t due for completion until the middle of next year, much of the art is now in place. 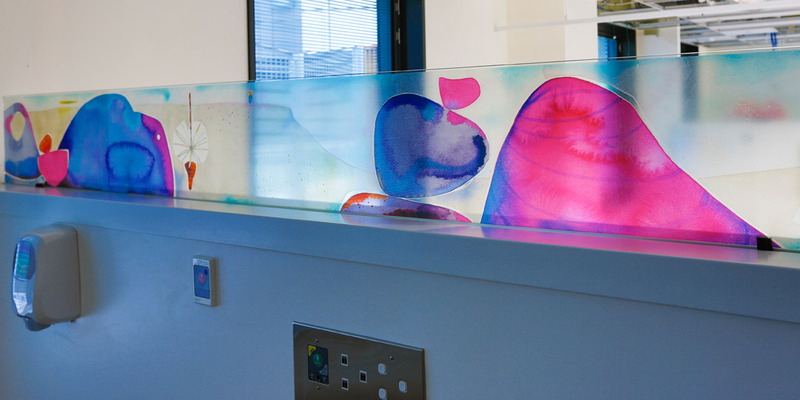 It ranges from large photographs which add splashes of colour and spark to otherwise sterile corridors, to nature-inspired graphics in lift lobbies and eye-catching sculptures in the landscaped courtyards. Judy Potter, chair of the SA Film Corporation and director of the Adelaide Festival Corporation, was hired early on as an arts consultant by hospital designers and builders the Hansen Yuncken Leighton Contractors Joint Venture (HYLC). Potter, one of our guides on the art tour, is an arts industry veteran – but this is the first job that has required her to wear a hard hat, and it’s one she’s clearly relishing. “It’s been a unique experience,” she says. Her budget for commissioning artworks was around $2 million. She worked with Arts SA and SA Health to commission artists to create work around the themes of water, flora, earth and community. Even in the hospital’s unfinished state – surrounded by dust, paint smells, half-unpacked furnishings, smeared glass and construction noise – it is clear that this experience will be very different from that offered by the current RAH. Our first stop was the Aboriginal Health Garden, which is bordered by walls made of Corten steel panels featuring designs by Kaurna artist Karl Telfer and Ramindjeri artist Sam Gollan. 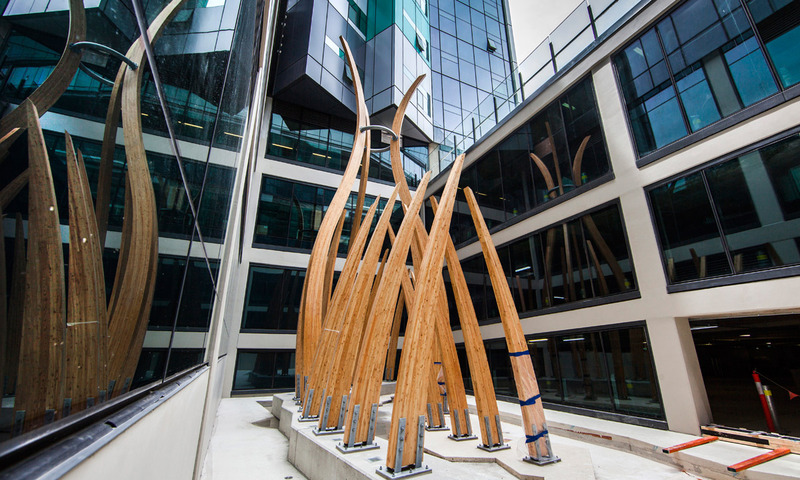 The designs tell stories of local history and seek to reinforce the idea that the garden, located near the entrance to the Aboriginal Health Unit, is for contemplation and healing. On completion, the unit will also feature a wall showing projected images created in consultation with the Indigenous art unit at Flinders University. Potter says that within the new hospital, art will help with “wayfinding”, making it easier for patients and visitors to identify exactly where they are within the 175,000sqm site. 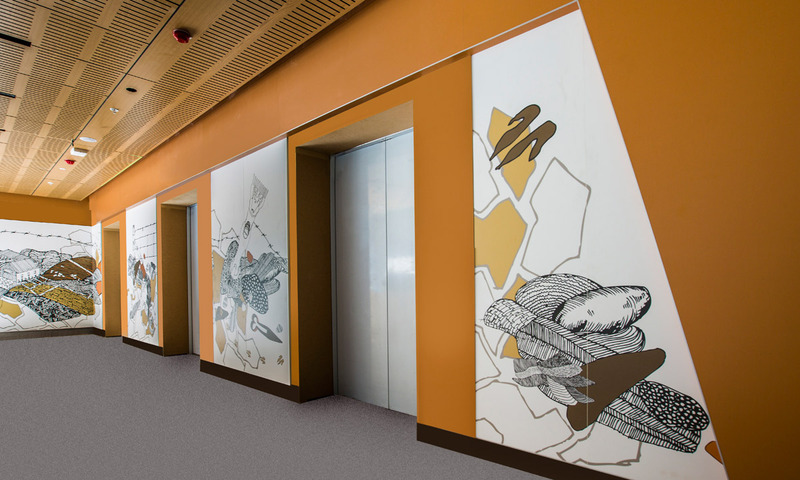 One example is environmental graphics by Kangaroo Island-born artist Annalise Rees, which enliven lift lobbies. Rees’ pictures incorporate quirky imagery such as Hills Hoists, Stobie poles and a dog on a motorbike. “Her images are so playful and gorgeous and so South Australian,” Potter says. “If you’re coming back numerous times, you’re going to see something different each time. It’s going to engage you and hopefully make you smile, but also remind you very much of South Australia. Throughout the hospital there are more than 100 open-air spaces such as courtyards, gardens, piazzas and landscaped areas, a number of which house sculptures or installations. Ian Hamilton and John Hayward’s Bowerbird sculpture features beams up to 12m high made of European larch. Reaching towards the sky and curving in towards each other, they are reminiscent of the skeletal remains of some giant and long-extinct creature. 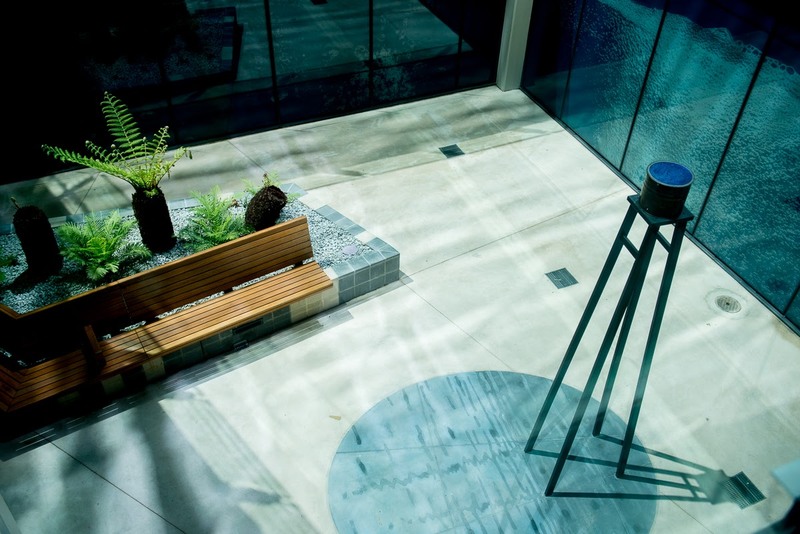 Another courtyard installation, by Deb Jones and Christine Cholewa, plays with the idea of water. Made of bronze, glass and concrete, it comprises a bucket elevated on a platform with what look like puddles pooling underneath. “It’s bringing in a bit of fun … we can’t have water in the hospital because of infection, so it’s trying to bring that peacefulness of water into the space,” says Potter. Outside the new RAH’s retail and café area, an installation by Hossein Valamanesh will have pride of place. Previously on display at the Adelaide Convention Centre, it incorporates a paved area with geometric shapes picked out in stone, tiles and paviours. Associated above-ground sculptural work includes stone columns, stone stairs, a halved granite boulder, wooden door and panels in the shape of a human silhouette. “It provides a real interest and activation between SAHMRI [South Australian Health and Medical Research Institute] and the [hospital] building,” Potter says. 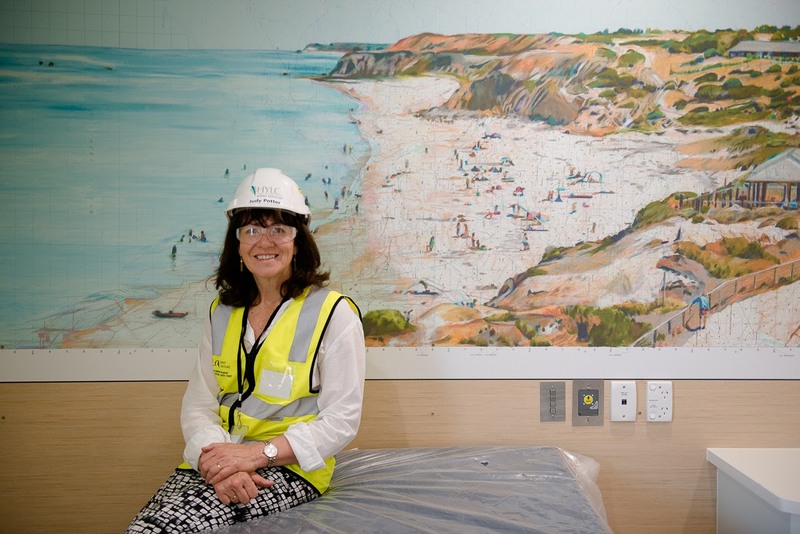 Rooms in the hospital’s new mental health unit feature large paintings by Laura Wills created over old maps of South Australia, while glass panels by Sue Ninham provide a calming distraction in the day treatment area for cancer patients. Ninham’s brief was a particularly tricky one – the panels are very long and narrow, sitting atop dividing walls, and one of the requirements was that hospital staff needed to be able to see through them. She painted watercolours featuring imagery inspired by the Flinders Ranges landscape; they were then transferred onto film so they could be put on the glass. “It’s linked to the earth theme, but we wanted light and liveliness,” Potter says. All the artwork in the new hospital is licensed, so that if it is broken or damaged it can be replaced. It also has to meet specific hospital requirements, such as being hard-wearing and using materials that are able to be scrubbed. 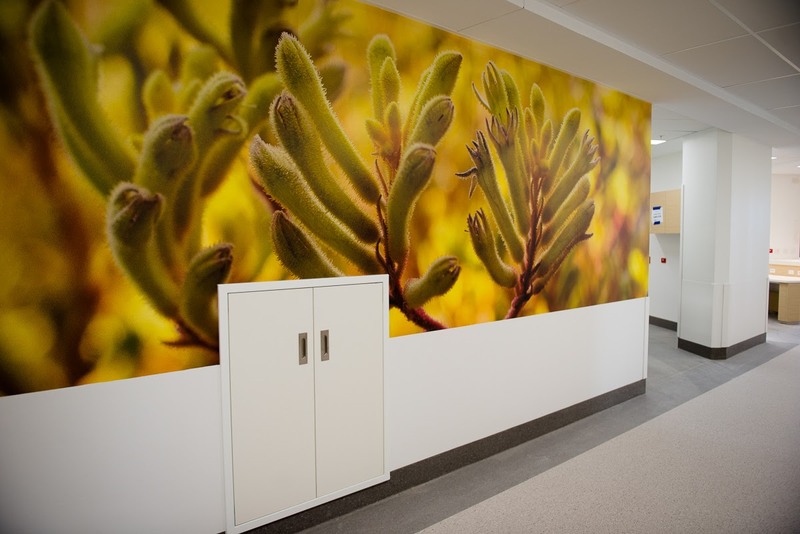 Possibly the most vibrant works are photographs reproduced at different sizes for walls in hallways or rooms throughout the In Patient Unit (IPU). They were taken by five photographers – Peter Barnes, Peter MacDonald, Sandra Elms, Tony Kearney and Hailey Lane – who created 18 different images. The largest of the prints are about 5m x 2m, and they show scenes ranging from cows in a paddock shrouded by morning mist to close-ups of beautiful banksias and kangaroo paws that pop with colour. “All of it is about bringing that sense of belonging,” Potter says. Most of the artists will have their first opportunity to see their works in the hospital during a visit next month. Potter says they are all excited to be involved in a project that could make a dramatic difference for people forced to spend time in hospital. “It’s been really critical that we make this to international standards … and introduce the best research into integrated art to offer the best experience.